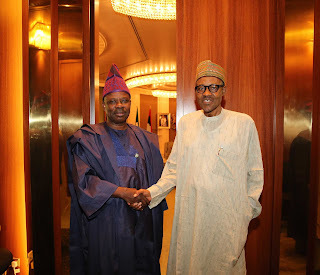 Governor of Ogun State Ibikunle Amosun on Tuesday visited the Presidential Villa, Abuja, where he met behind closed door with President Muhammadu Buhari for about two hours. Amosun had on Thursday met separately with President Buhari and Vice-President Yemi Osinbajo over political developments in his state. Though agenda of today’s meeting between President Buhari and the governor was not made public, the governor may update the president on political happenings that trailed the conduct of All Progressives Congress primaries in Ogun. This declaration came some hours after the state chapter of the APC also declared the Gov. Amosun’s preferred candidate, Adekunle Akinlade, as the governorship candidate of the party. The governor had at the weekend allegedly accused some political interest group of `misinforming’ President Buhari about `political equation’ in Ogun. Amosun, who made the accusation on a national television during the live coverage of the APC senatorial primary in the state, vowed that his preferred candidate for the governorship seat, Akinlad, would emerge victorious at the end of the political dispute. The outcome of the closed door meeting was still being awaited as of the time of filling this report.